The CoffeeShop Blog: CoffeeShop Facebook Cover 5! I just learned how to make curves using the pen tool in Photoshop (I might post a tutorial on this if anyone is interested) and I decided to make a new Facebook cover with the results of my experiments. This is the standard-sized Facebook cover and the file is a fully adjustable layered psd file you open in Photoshop or PSE. This would also make a great blog/website header. When you open the template you will see the layers in the screenshot above. 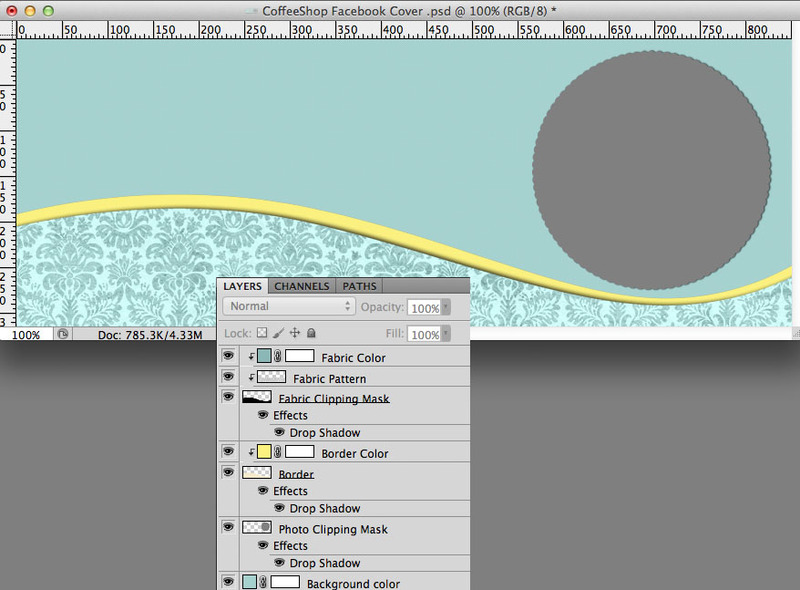 Change the top background color on the layer pane by clicking on the little blue square. Use the photo clipping mask to add your image to the round frame. Change the border color by clicking on the little yellow square by Border Color. Change the fabric color by clicking on the little blue square by Fabric Color. You can even add your own texture by clipping it to the Fabric Clipping Mask layer (where I have Fabric Patten). 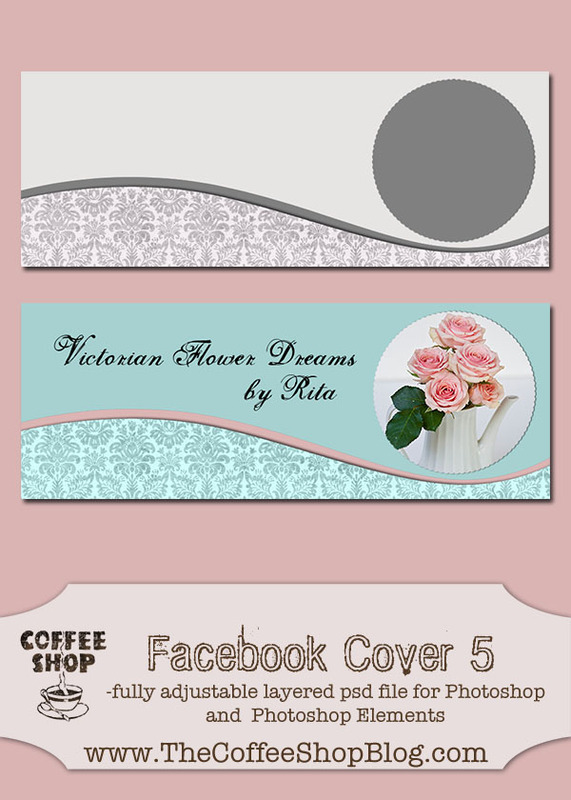 Download the free CoffeeShop Facebook Cover 5! You can also download it here. I just learned to use the Pen tool to make a football for a birthday party theme. Learning the pen tool was very tricky and I could use more tuts to me to get different perspectives on using it. Thank you for your work! Oooh, oooh. Raising hand and waving it madly. I would love a tutorial. :) And thank you for the lovely cover template. Thank you so much for this post. I want to let you know that I posted a link to your blog in CBH Digital Scrapbooking Freebies, under the Page 3 post on Apr. 17, 2012. Thanks again. Thank you for all the freebies you make and share. Tutorials are always helpful, whether for learning or refreshing the memory! Thanks! Is there a pen tool alternative in pse?? Thank you - I love to change my cover and your templates help make it fun!! very cool. i found your blog a few days ago...i would love tutorials on photoshop! just wanted to say thank you for sharing... I downloaded this file and made another cover photo with one of my granddaughters but decided not to use it... I'm not happy with the photo I chose but will eventually find one that I want to display as either my cover photo or give it to her to use on her FB page. I appreciate your generous spirit and your talent! Thanks so much for this gorgeous curves template Rita. I'd LOVE one of your tutorials to cover how to make curves with the pen tool. I'd really like to play with it too, but have no idea where to start. Great template - so classic! Thank you very much!